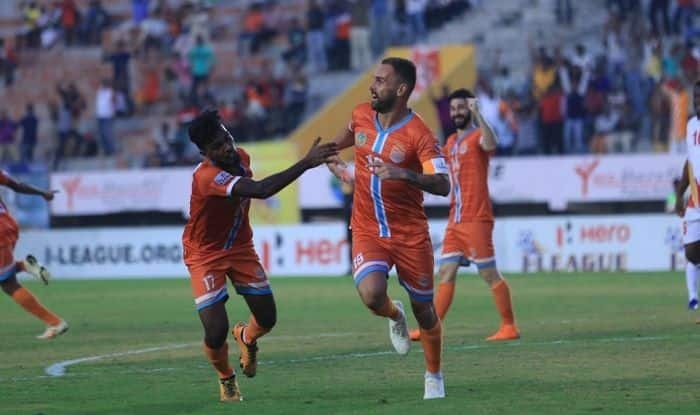 Spanish striker Pedro Manzi continued his goal-scoring spree, inspiring Chhenai City FC to a 2-1 win over East Bengal to consolidate the side's top position in the I-League here on Monday. Spanish striker Pedro Manzi continued his goal-scoring spree, inspiring Chhenai City FC to a 2-1 win over East Bengal to consolidate the side’s top position in the I-League here on Monday. Manzi scored his 11th goal of the I-League season in the 48th minute and Romario Jesuraj netted the other in the 70th minute after Laldanmawia Ralte had given East Bengal a ninth-minute lead. Chennai City are now firmly perched on the top of the league standings with 27 points from 12 matches, a clear five points ahead of second-placed Churchill Brothers. They had beaten East Bengal with the same scoreline in the first leg in Kolkata. East Bengal, on the other hand, remained on 19 points and at the sixth position. Their hopes of a first-ever I-League triumph are fast fading away. Chennai head coach Akbar Nawas, on the other hand, started Pravitto Raju in place of Shem Martin Eugene. The visitors got a corner and Lalrindika Ralte sent the ball towards the far post, which central defender Borja headed back across goal for Laldanmawia to nod home from close. Chennai then upped the ante, looking for an equaliser and a wonderful Roberto Eslava ball found its way into the box to midfielder Nestor but Samad shielded him away. Then in the 34th minute, Nestor’s midfield colleague Sandro unleashed a rasping drive from outside the box but East Bengal keeper Rakshit Dagar brought about a good save. Chennai went into the break a goal down but clearly on the ascendency. They got their equaliser three minutes into the second half through Manzi, which put him in joint top scorer’s spot with Churchill Brothers’ Willis Plaza. Romario Jesuraj went out wide and cut in and then pulled the ball back for an onrushing Edwin Vanspaul. Vanspaul’s effort towards goal found a deflection from Manzi and wrong-footed Dagar to enter the net. The hosts then went ahead thanks to a brilliant tactical change by Nawas. Raju was sent wide on the right flank and Romario Jesuraj brought in-field. In the 70th minute, Raju collected the ball on the right flank after East Bengal left back Manoj Mohammad failed to intercept and cut inside to lay it off for Romario on top of the box. His shot found the right corner of the net.